Description Professional ceramic artists gallery work, with a special exhibition and online sales. Description Introducing Japanese tradition to the world. We are selling traditional decoration items that are still used in Japan today. Description Hiroshi Nishi antiques bought and sold in Europe. We buy directly from the antique shop owner that the concept of European antiques for everyday use. European porcelain, we are mainly silver. Description The wooden sculptures of animals around, and sells. 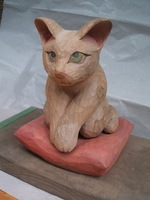 We produce and sell the wood carving. We accept work orders.